The team at LEAD have had the privilege of working with Pacific communities, CBOs and NGOs since 1998. The trainers and consultants working in LEAD were responsible for designing and delivering the Graduate Certificate in Pacific Management and Leadership (Unitec NZ). Prior to this they worked extensively across Pacific Islands (Fiji, Micronesia, Papua New Guinea, Samoa, Solomon Islands, Tonga, Vanuatu), in partnership with the Pacific Island Association for NGOs (PIANGO), to deliver the Graduate Diploma in Not for Profit Management. Click here for the 2015 review of this hugely successful programme. Our trainers and consultants continue to work with individual NGOs and national associations of NGOs in Fiji, Papua New Guinea, Samoa, Tonga and Vanuatu. Current and past clients include: Pacific Bible Society; WWF Pacific; PNGLMMA; Praxis; Pacific Octagon Programme; SPC; Pacific Leadership Programme (AusAid); SUNGO; ICTP; FAO; MFAT; Asia Development Bank, ICSW. One of LEAD’s most valued partnerships in the Pacific is with the David and Lucile Packard Foundation. The LEAD team and the Foundation have been working together since 2010 providing leadership and NGO management training to marine conservation community leaders. 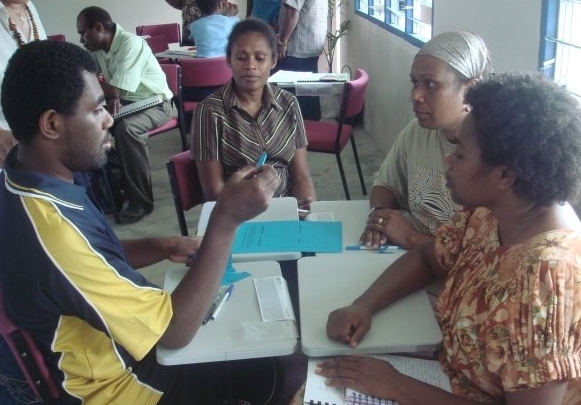 This project included one week workshops, a Train the Trainer programme, and the establishment of a Suva reference group to foster an enabling environment for leadership development in Fiji. Click here to see an evaluation of our 2016/17 programme. In 2015 this project expanded to include leaders from all sectors, and in 2017 the team co-created a leadership programme to be delivered in villages in Macuata, Northern Fiji. Co-design was with district reps and chiefs from the province and includes LEAD building and mentoring a delivery team of local facilitators. The first round of training in March 2018 was a resounding success with over 100 leaders from 10 districts participating. We would like to thank the villages of Cawaro, Vunivutu, and Navesidrua for hosting the training and for also sharing their homes with the LEAD team. Content of the training included exploring what leadership is and the challenges facing community leaders in Fiji; what good leadership looks like in a Fiji community context; project design delivery and evaluation; and budgeting. Participants are now working on projects that align with the Macuata Provincial Framework and will gather regularly during 2018 to reflect on their leadership learnings and participate in further training. These leaders were the first to engage in a conversation being initiated by the reference group who are interested in identifying what good leadership looks like in the sustainable development/environmental conservation sector in Fiji. The gathering of this information will continue over 2018 and 2019 enabling the creation of a model of Pacific leadership that we will be able to share with other sectors.